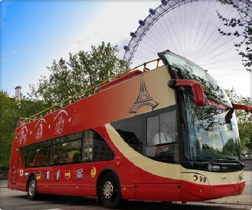 CONVERTIBLE-TOP BUS: See Paris in Any Weather. YEAR ROUND: FRESH AIR IN SUMMER & HEATED IN WINTER. ENJOY AMAZING VIEWS: Many Major Parisian Attractions. EFFICIENT: See Many Amazing Sites in 1 Hour 45 Minutes. GREAT INTRODUCTION TO PARIS: Visit The Most Important Sites With NO STOPS. INFORMATIVE AUDIO WITH HEADPHONES: Listen in 9 Languages. BUS TOUR + RIVER CRUISE: Add a Beautiful Scenic Cruise To Your Bus Tour. CRUISE LENGTH: One Hour Cruise Passes Amazing Scenery. RIVER VIEWS: See Paris From the Most Beautiful Boulevard in the City! INFORMATIVE AUDIO TOUR: Relax Comfortably and Learn About The Sites. ANY WEATHER: Glass Covered Boat Allows You To Enjoy Paris At Any Time of Year. SAVE MONEY: Book the Cruise & Boat Together and SPEND LESS. MINIMUM 3 DAYS ADVANCED BOOKING REQUIRED.